Last night our 2017 robot named “Blaise’n 40” was bagged at 11:55pm on Stop Build Day! Blaise‘n 40 is named after Blaise Pascal and the 40 kiloPascals needed for a ranking point which we aim to complete with 40 high goal shots in the autonomous period. 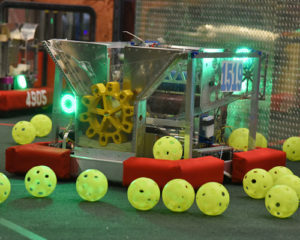 We look forward playing the FIRST STEAMworks game with many great New England teams at our two district events: WPI District on March 8-10 in Worcester, MA, and Pine Tree District on March 30-April 1 in Lewiston, ME. The competitions are free and open to the public, so check out these tournaments and witness the thrill of FIRST Robotics Competition!